Theodoros Tsorbatzoglou is FIDE Master, Chess Olympiad participant, events organizer, Marketing and PR specialist. Mr.Tsorbatzoglou will be chief organizer for the 2008 Halkidiki Chess Festival and 2008 European Club Cup, and this was good reason to ask him for an interview. Chessdom: Hello Mr. Tsorbatzoglou. As Head of the Organizing Committee of Games Festival, can you introduce us with the Halkidiki Chess Festival 2008? Theodoros Tsorbatzoglou: Hello, thank you for the opportunity. Halkidiki Chess Festival is an annual event, running for the forth year. This year we have even more important events as World FIDE Amateur Championship (for players under 2000 rating) and International School Cup which is the same time the European Individual School Championship. Moreover the traditional Halkidiki Chess Open (for players over 2000 rating). Parallel we have an official Arbiter seminar which can give International titles to the participants, the 2nd Chess Marketing seminar, a School Teacher seminar and an International Blitz tournament. Chessdom: You are also organizing tournaments and exhibitions for other sports? 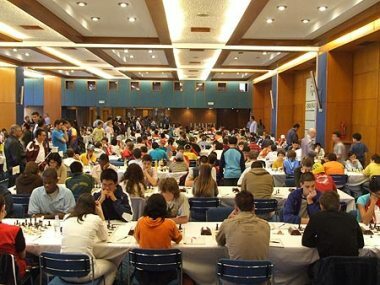 Theodoros Tsorbatzoglou: Yes the Chess Festival is part of a huge Games and Sports Festival including bridge, billiards, darts, scrabble, tennis and other popular activities. There are also art exhibitions and an excursion and entertainment program. Chessdom: What were your impressions about the last year Festival? Theodoros Tsorbatzoglou: The Games and Chess Festival grows every year. Last year we had 2.000 participants and visitors. There are some similar events in Europe but I think that ours is one of the most attractive and well organized. Few months ago we have received a request to organize something similar in Disney Resorts in Florida! Chessdom: Can you tell us more about the accommodation, playing venue and infrastructure? Theodoros Tsorbatzoglou: This year the festival is between 28th April and 6th of May. 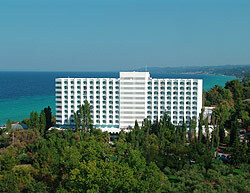 The venue G-Hotels in Kallithea Hakidiki is very popular and favorite between the chess players. 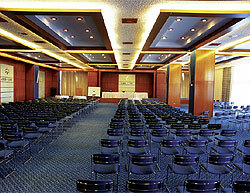 We use a total of 5.000 sq m. of conference and exhibition space. We can guest inside the complex 2.500 people and much more 100 meters around. Chessdom: How many participants do you expect? Theodoros Tsorbatzoglou: We hope to break last year record and to reach 1500 participants and in total 3.000 persons with visitors. Chessdom is an additional value in our efforts for publicity. Chessdom: It is very interesting to take a look at the career of a skilled organizer and manager like yourself. Tell us a bit about your experience as a chess player and how did you decide to become an organizer of chess events? Theodoros Tsorbatzoglou: I have reached the level of Fide Master and rating about 2370. I have played in Greek National Junior Team and in the second Greek Men Team in 1988 Chess Olympiad. I stopped professional chess 20 years old, because I had to finish the University. I worked also as a chess trainer but I finalize my position in chess as an organizer. Today I am owner and running a company specialized in events’ (different kinds) organization, Marketing and PR services. The company grows and I believe that in the next years will be one of the leaders in Greece. Chessdom: Greek Chess Federation is not only actively hosting various chess competitions, but you have also set very high organization standards. How did you achieve this? Theodoros Tsorbatzoglou: It is a fact that Greek Chess Federation is one of the most developed in the World. It is not only the successful chess events, it is also the technical and administrative staff in all levels, the grow of top chess and National teams and the boom in mass chess (schools, amateurs). But the secret of success is that we are working in a decentralized system where people from different country areas, using their local union or club or company, can develop their creativity through new chess projects. Of course important assets for the successful events are the weather conditions the tourist infrastructure and the country position among three continents. Chessdom: You will also be in charge of the organization of European Club Cup in fall 2008. During our stay in Creta, Mr. Giorgios Makropoulos told us that you need only 2-3 months to prepare everything. Can you introduce your team and tell us what your secret is? Theodoros Tsorbatzoglou: We are working 8 years in top and mass events so there is an important experience. Moreover some parts of the organization are ready from the previous years. For example we don’t need to work a lot on booking or transportation systems because we have already developed and used them. Let me introduce our team. It is our land, the sea, the sun, the Greek history but the most active members are our quests! This is the secret, our quests. When you will come in Halkidiki you will realize that our success belongs to them. We work together and we have fun together. Now especially for the European Club Cup (11-19 October) we are preparing some innovations. I can reveal one on you. We will ask and recommend (not forced) to all teams to appear with the same dressing (at least T-Shirts). We will be able to produce and provide this material also in Halkidiki. So one team can order with its registration and his dressing package, with the team name and logos, probably and with the individual names. If we want to be a top sport with TV coverage we must prove it. Have you ever seen any important sport event in TV without a sport dress code? Chessdom: You took participation in FIDE Congress in Antalya. What are your impressions? Theodoros Tsorbatzoglou:It was a successful Congress in a nice atmosphere and excellent conditions. I think that the Turkish Chess Federation organized the best congress till now. And my word is more worth if you take in consideration that I have organized two FIDE Congresses on 2001 and 2003. Chessdom: What are for you the main results of this Congress? Theodoros Tsorbatzoglou: I keep two thinks. One is that FIDE is in the best financial condition of the last 20 years. This is a result of the successful last years’ management. Events like Olympiads, Youth and World Championships bring an important income in Fide budget. Of course we can never forget and the generous funding by FIDE President. Second is the important marketing and commercial steps. Fide established a Marketing department, appoints a commercial director, signed an agreement with Global Chess and appoints a CEO-Development with the objective of developing chess and assisting FIDE in making the organization more professional. All these of course need the proper co-ordination because a successful marketing policy could be only one and all the parts to follow the same direction. We have to wait for the market analysis and the 3-4 years marketing plan for the re-positioning of chess in sports’ market.